If you’ve browsed our online store, you may of noticed in the ‘Coming Soon’ section I’ve had a T.H Brown fondue coffee table and stool set sitting there for perhaps a little too long. The table and glass are in great condition, and were not the hold up! It was/is the 3 stools. Anyways, back to the stools. As you can see from the images below 10mm particle board was used, along with some rough cut pine which was all held together with a few nails. Time and moisture have played their part which left the frames in pretty poor and unstable condition. There’s no way you’d ever apply new upholstery over the top! So before moving ahead I wanted to re manufacture the frames for the 3 stools to a higher quality than what was there before, to ensure they’ll last for as long as is required! 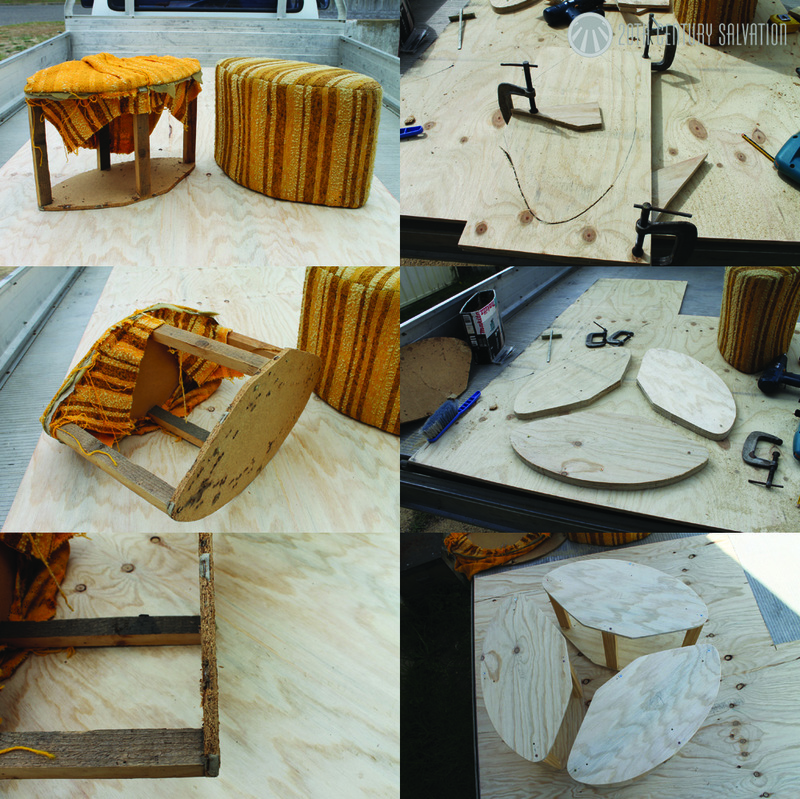 I used the base from one of the stools as a template to ensure I ended up with the same shape. This shape was traced onto 12mm plywood (much preferred than particle board although double the cost $$), 42mm x 18mm pine along with some 50mm long screws, nails, and wood glue will provide a plenty solid and long lasting frame for the new upholstery to be applied too! Now just to select the material! 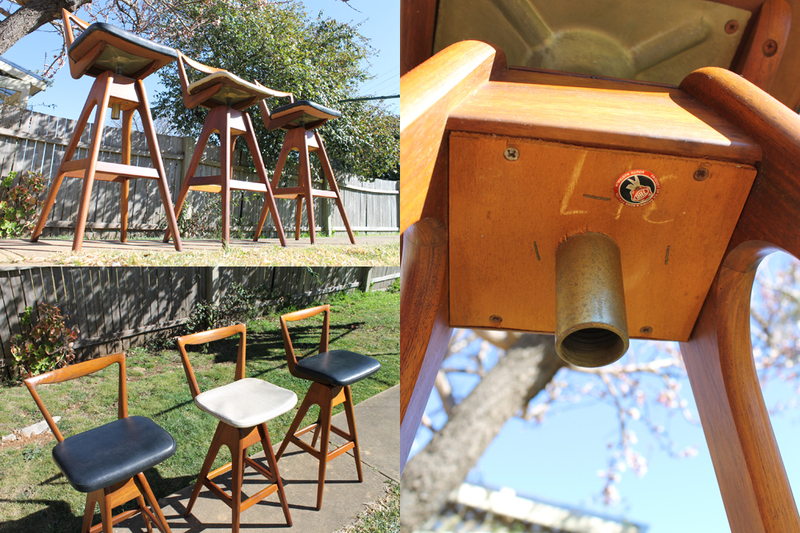 T.H Brown Stools – Iconic. Mid Century. Design. Just a few words to describe what i’ve been lucky enough to have in my possession for the last 2 years or so. However the time has come and they’ve now been sold to a lucky new owner hundreds of kilometres away. Whilst giving the stools one final polish before I packaged them up I was totally blown away again! by the design, the use of timber and the high quality workmanship that went into these stools. I was so impressed that I felt it was necessary to take them out on the first day of Spring (last Saturday) and get a few final pictures for my own reference! I’ll definitely be sad to see these stools go, however a big part of what I do, and what I get enjoyment out of is finding new homes for these beautiful pieces of furniture and these are no exception!